Did they keep the "gotcha" thing where jackalweres shrug off silver weapons, but are vulnerable to cold iron? No jackalweres are vulnerable to silver and cold iron* isn't mentioned. Since no moon phases or anything is mentioned, the only difference between lycanthropy and reverse lycanthropy is that the latter isn't transmittable and that the true from of the lycanthrope is different (humanoid vs. beast). I like the fairly low-level take on the jackalwere. Makes them a good villain group for low-level parties, and means you can have mid-level groups fight hordes of them (co-operating with gnoll hordes, and ruled by a lamia or three, amirite?). The kenku is another D&D monster that originated in the Fiend Folio/Fiend Factory. Wikipedia claims it's based on the "karasu tengu". I can't vouch for that, but the design is tengu-like and the name is Japanese-sounding (though probably just made up). The Fiend Folio kenku is very mysterious. It never talks and you never know what it's planning. The 5e kenku looks less hawk-like and more like a crow. In 5e, kenkus are greedy rogue-style vagabonds, so I guess the whole money-and-dagger thing fits. Those legs look a bit reptilian, though. According to the fluff text, kenku have "shameful forms". I'm not really sure why. They aren't really any worse than the five dozen other anthropomorphic animal races in D&D Land. Kenku do have an inferiority complex, though: They once were flyers and served a powerful unknown entity. Being greedy, the kenku stole a book which contained the secret of speech from their master's library and dressed up as beggar to beg for valuables. Not the best plan, but this part of D&D mythology, so it's okay. The master wasn't pleased and took both the kenku's voice and their ability to fly. Being frustrated, the Chaotic Neutral kenku now execute people by throwing them off building and punish others of their kind with stuff like heavy wings of shame. I guess that's the kenku version of the donkey ear hat. Mechanically, the kenku sneakiness is represented by Deception and Stealth as well as the ambush trait (advantage against ambushed enemies) and the mimicry ability: Kenku excel at mimicking sounds, be it to lure people into an ambush or to communicate. Kenku can repeat spoken words, but cannot form new sentences. Among one another, kenku have codes (e.g. the noise of a dog could be an attack signal) and read one another's body and facial language very well. 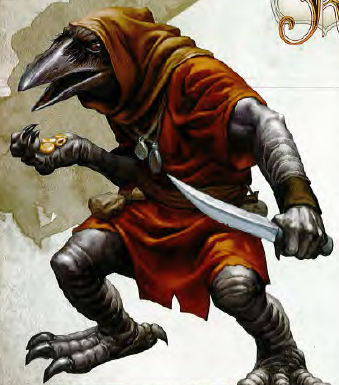 Bottom line: I like the kenku's origin story and the mimicry ability is pretty neat, but I think there should be both frustrated beggar kenku and mysterious secret agent kenku of AD&D fame. Kenku got very popular somewhere along the line as a PC race for 3.5/PF, I think, despite the sign language/mimicry requirement. I've been curious as to why, to be honest. Honestly, I really like the Invisible Stalker art here. Invisible Stalkers are awesome. I had an antagonist summon these things by the dozen as the kickoff to a plot, and for level 3-5 characters they are impressive foes to be sure. Made all the better by survivors rambling in terror about "demons from the sky" strangling everyone to death one-by-one. Ah, good times! I seriously encourage anyone using them to think less "spooky air thing" and more "xenomorph". One of the villains in princes of the apocalypse uses one called whisper as a bodyguard. Her favored use of him however is to have kill minons that disappoint her while she does hand gestures that make it look like she's doing Darth Vaders force choke to them instead. I have to admit: that actually earns her some style points from me. I suspect it's because they're kind of a 'dark' alternative to halflings as a 'rogue-race'. Say you want to play a rogue character. Halflings are the race most suited to the class, but are also, when you get down to it, hobbits. While there have been efforts to make halflings less like a bunch of bumbling farm-kids, they're still not exactly what I would call dark, gritty protagonists. Kenku, on the other hand, are greedy, vicious little bastards that make good rogues. Let's be fair now, gnomes are mostly known for two things: (a) crazy inventions that explode half the time and (b) looking decorative on lawns. Unless we want to go with the theory that all that is just a very clever masquerade, neither exactly suggests "rogue".